I’ve spent a good bit of time in Germany, and except for a surreal trip to a Japanese restaurant in Ulm on my first trip, my food experience hasn’t been much more adventurous than ordering two currywurst at once, and about as varied. I arrived in Berlin ready for a week of kebabs and sausage, but instead was pleasantly and wonderfully surprised by the diversification of food available. First highlight came at Ständige Vertretung, a riverside bar/restaurant in the city, where, finding ourselves very comfortable after a couple of Kölsch beers, we ordered a Flammkuchen. This is essentially a pizza, in that it’s a dough base with melted cheese and other toppings. These were no ordinary toppings however. We had the house special, which came with Apfelkompott und Blutwurst. Yes, I kid you not, black pudding and stewed apple (oh, and ‘gratinated’ cheese, as it said on the menu). It was delicious, so much so I want to add it to my cooking repertoire. The flavours worked perfectly together, as unlikely as that may seem. Pizzas were actually a bit of a theme during the week. The next day for lunch we had stoneoven pizzas in Mitte, at a stand-up kiosk near Sergi’s work. They had really simple toppings - all with mozza, and then maybe mushrooms, or salami, or basil and tomato. They were pre-prepared, but cooked to order and a filling, thrice-sliced slab was €2. Absolutely perfect for an outdoor lunch on one of the most perfect days of weather I can remember. Afterwards the others had to go back to work and I whiled away the afternoon dozing and reading Hemingway on some grass in Potsdamer Platz! 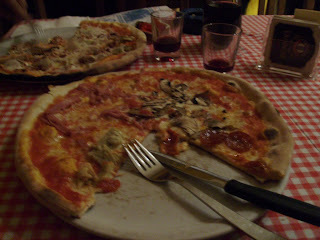 My favourite pizza experience though came a few nights later at a il Casolare, a trattoria in Kreuzberg. I think this is now my favourite restaurant in the world (yes, I would even eat there in preference to il Carusi). The restaurant is kitted out very authentically and unaffectedly. The walls are covered with leftist propaganda posters and the scribblings of who knows how many guests (we added our own Vicky Leandross quote in German and Spanish ) I stole a copy of the menu, because it’s a wonderful document. You know how much fun Italian menus are to read, how appetising everything sounds? Well this one was in Italian and German, and it was just wonderful to read all the pizza descriptions side-by-side in the two languages (eg would you prefer ‘fagioli’ or ‘bohnen’?! ), and even more fun were the ‘useful Italian expressions’ translated into German, eg ‘Sei molto carino’ = ‘Du bist sehr hubsch’ (you are very handsome). And then the pizzas. I don’t know which was more striking - the size or quality. They are all huge, and I may not be Italian, but I live in Melbourne and know a good pizza and these were very very good pizzas. All served by rude, brash, Italian speaking waiters. Fantastisch! Speaking of Italians, there’s a couple of quality Italian cafes these days in Kreuzberg. We had Saturday brunch in Principe di Napoli - ciabatta with prosciutto crudo and pecorino for €2.50, thank you very much. More interestingly, they served Prosecco vom Fass (on tap), from a huge barrel in the corner. You could have a glass with breakfast or take a litre bottle home. And, they had a pump action coffee machine - very impressive for Germany. Unfortunately though they still served German style latte macchiato - a tumbler of hot milk with an espresso poured in the top. I’ll stick with just the espresso.